Prior to 1969, German Measles, also known as Rubella, was a common, contagious disease which quickly spread amongst pre-school and elementary school children. However, since a vaccine was released in 1969, the condition has become pretty rare in the US. Most commonly, it affects young adults and children who have not received the German Measles vaccine. Those in confined spaces such as schools and military bases, tend to be at an increased risk of developing the condition. 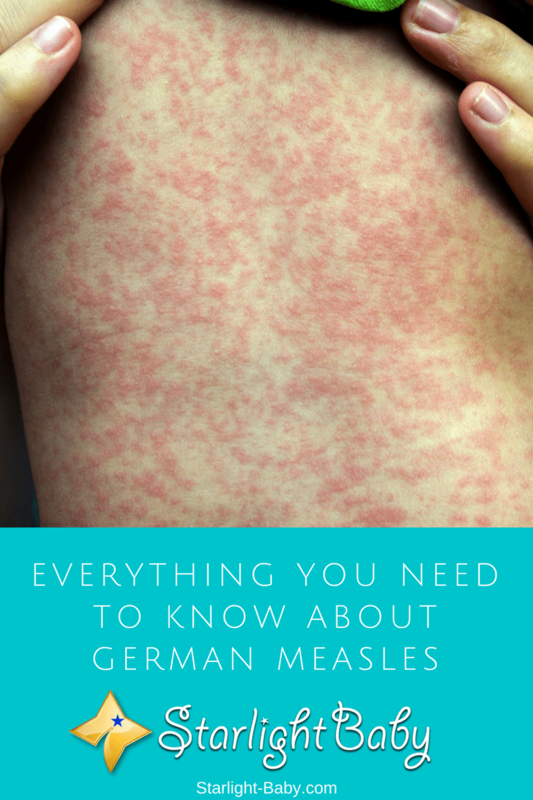 So, what exactly is German Measles and what symptoms should you look out for? Find out everything you need to know below. German Measles is a contagious, viral infection, caused by the Rubella virus. It takes approximately 14-21 days for symptoms to begin once it’s been passed on. It’s typically a very mild infection, which means it’s very rarely serious and it tends to pass within a week, even without any form of treatment. However, the only exception to this is if a pregnant woman develops the condition; especially during the first trimester, as it’s known to cause severe birth defects. As it’s contagious, the disease can pass quickly from person to person, through tiny droplets released via coughing or sneezing. It mainly affects the lymph nodes and skin. The rash is the most common symptom you’ll experience. It tends to start on the face and then spread down the rest of the body. Some find the rash a little itchy, and it’s generally not as brightly colored as the standard Measles virus. It will typically last around 3-5 days before fading. Some of the symptoms are more common in adults, rather than children, such as muscle pain, a stuffy or runny nose and tender or swollen lymph nodes. It’s also worth noting that although extremely rare, German Measles can lead to brain swelling. So, if you experience a stiff neck, a prolonged headache or earache, you should seek advice from a doctor as soon as possible. These symptoms are extremely rare however, but it’s still worth being aware of them so you can seek immediate treatment if needed. Children and young adults who haven’t been vaccinated against Rubella are most at risk. In most cases the disease isn’t serious, however if you’re pregnant and you pick up the disease, it can cause significant risk to your unborn baby. This is because the Rubella virus affects baby’s undeveloped organs which can lead to congenital rubella syndrome. Just some of the problems this can cause include deafness, cataracts and lung, brain and heart abnormalities. There’s also an increased risk of miscarriage if you develop the virus within the first 3 months of pregnancy. However, if you’re more than 20 weeks pregnant, the chances of your baby developing congenital rubella syndrome is extremely small. Your pediatrician will typically check to see if you’re protected against conditions such as Rubella, when they take blood tests early on in the pregnancy. Those who have been previously vaccinated should be immune. However, if you’re worried you have come in contact with the virus, you can ask your doctor or pediatrician to conduct tests just to be sure. As German Measles usually prevents very mild symptoms and clears up on its own within a week, treatment is not usually required. The immune system will automatically produce antibodies which fight off the infection by itself. What’s even more impressive, is these antibodies usually last for life. So, once you’ve experienced German Measles, you’re unlikely to ever get them again. There are a few measures your doctor may suggest you or your child take to treat some of the symptoms. For fever, aches and pains, you may be instructed to take paracetamol. However, you should never give your child paracetamol unless the doctor or pediatrician has advised you to do so. Usually, fever in children can be cleared up naturally by ensuring they drink plenty of water. If symptoms do not appear to be clearing up by themselves, you’ll need to go to the doctor to get properly checked over. The Rubella vaccination is the only way to prevent the virus. Children are typically given two vaccinations to ensure they’re fully protected, including one when they are 12-15 months old, and another when they’re aged 4-5. Obviously, vaccinations aren’t for everyone and as German Measles isn’t usually serious, it’s purely down to an individual’s preference whether or not to give their child the vaccine. It’s therefore a good idea to weigh up the pros and cons and do as much research as you can to ensure you’re making the best decision for you and your child. Overall, German Measles isn’t usually serious, and it does tend to clear up by itself. If you suspect your child does have the virus, it’s best to get them checked over by the doctor just to be sure it is German Measles and no other potentially more dangerous disease. When I was pregnant, I am very careful with myself. I don’t usually go out and mingle to crowded places. I’m afraid that what happened to my cousin might happen to me too. It was the year 2006 when my cousin got pregnant with her first baby and she suffered from German Measles for one week. Today, her 10 years old son is suffering from hearing loss. According to her doctor, the reason for her son’s hearing defect is what they call “Congenital Rubella Syndrome”. That is the effect when you get German Measles during your pregnancy. It can also cause brain damage, heart defects, and cataracts to babies. The saddest part is, when you are pregnant and you get German Measles, there is no cure. So sad to hear about your cousin’s son. That’s the sad part about getting sick when one is pregnant – the disease can affect the unborn child and we can’t do anything about it. I’ve heard of German measles from one of my OB-Gynes before, and I was really scared of it because of the fact that it can cause abnormalities in babies. I thank God that I didn’t have it or any type of measles whatsoever when I got pregnant with my kids. From the day that I confirmed I’m pregnant, I really go and see my OBGYNE just to make sure everything is alright. I was paranoid about the possibility that I will suffer or my baby because of carelessness. German measles during pregnancy specially the first trimester which is the development of major organs of the fetus is very alarming. Pregnant women should not neglect it that’s why proper education is important, reading reliable articles and magazines would help too. It’s not necessary where to get the vaccination, it’s available from health centers or private clinics. It’s our responsibility as parents to know what are the necessary vaccinations our child should have at right timing. Having a vaccination book record is a big help to monitor the vaccinations, when it was last given and nxt to have it. Prevention is better than cure as they say. It’s such a good idea to note everything, aside from tracking the health records of our kids, less worries and they may not be 100% secured from getting any possibilities of acquiring virus but having immunized would be less harmful. The CDC states that MMR vaccines (measles, mumps, and rubella/German measles) should be given to children in two doses – the first one between the age of 12-15 months and the second dose between the age 4-6 years old. It would really be irresponsible for parents to not have their kids vaccinated with MMR because it is now very popular and necessary. As you said, prevention is better than cure. Women who are at the right age now for marriage and pregnancy should already have the protection against German measles considering that the first dose was introduced and used way back in the 1970’s and the second dose in 1989, according to Wikipedia. Women who were babies before the vaccines’ introduction may not be so lucky and are at risk of contracting the disease, although I’m sure that would be very rare considering that they are now way past their prime for pregnancy (but could still get pregnant though if they have not gone through menopause yet). Measles are very deadly to both young and adults but it’s fatality rate is higher in children if they haven’t been vaccinated. It can kill a child within days if care is not taken. I had an experience with Measles when I was at my adolescent age around 17-19 years. I never know the reason why I had it at such old age. Although, I was told that before I was due for its vaccination as a baby, I had the viral infection and after that I was still giving the vaccine. I don’t know if it was the reason I still got infected with it at my teenage age. Whether it’s German Measles or any other form of it, Measles are very deadly. I totally agree that measles is very deadly. It’s a dreaded disease, especially in children. So it is really important that parents follow all the required vaccinations for babies because it can save their lives, however, some parents are not into vaccines. This doesn’t mean they don’t care about their kids. They just have a different opinion and would rather protect their kids in ways they believe in. No parent would want to endanger his/her child’s life. In my country, mothers are always advised to take their children to the hospital for vaccination against measles. Some people are also paid to move around from door to door asking if there are children below 5 so they can give them the vaccination for free. Even if the symptoms caused by measles can be handled, I feel no one should miss having the vaccination. Prevention is better than cure. Some countries do require parents to bring their babies to hospitals or healthcare centers for vaccination in order to prevent the disease. However, I do think parents should be given the freedom to choose how they want their babies protected because not everyone believes in vaccines. I think alternatives should also be made available to those who do not want to avail of vaccines. It’s seriously scary to me that diseases like this that were almost completely extinct in the Western world are on the rise again due to the anti-vaccination movement. I understand not everyone is a candidate for vaccination and parents do have the right to choose not to have their children vaccinated, but a lot of those decisions are based on misinformation and it just makes me so mad! It’s likely some are just paranoid because they’re misinformed about vaccination, while others can’t be blamed for not wanting to do it because there are actual reported cases in the U.S. about deaths from vaccine. It’s a small number as compared to the billions of people who are alive now probably due to vaccination, but there are still cases and some just can’t seem to avoid getting paranoid. I do think both the pro-vaccine and anti-vaccine people only have their child’s best interest in mind. I agree both are doing what they think is right for their children. I also agree that vaccines do carry some legitimate risks, including death in rare cases, and that not all children are candidates for vaccination. However, the success of vaccinations depend on herd immunity. More and more people are choosing to not vaccinate children that would otherwise be suitable candidates for vaccination due to a lot of the misinformation, and it puts them and everyone else around them at great health risks. I’ve heard of measles and never thought of German measles. I always see how these measles make some kids cry in pain and feel uncomfortable about such situations and it makes me feel sad too. It will be awesome to see the vaccination against German measles given to most kids around the world to reduce it’s spread since it is as well a contagious disease. I do think most countries already offer anti-German measles vaccine. I think it’s coupled with mumps and the regular measles vaccine. I’ve heard that some even have 4-in-1’s or 6-in-1 vaccines. It’s great to hear that most countries already offer these vaccines and I can say that’s true of Nigeria, where I reside, for government has even employed health practioners that go to schools and homes to vaccinate these kids against these sort of diseases. I’ve seen some nursing mothers that agitate against their babies being vaccinated and it’s a worrying situation to me and hope these ones should understand that it’s a good gesture by government. I gave my baby a shot for Rubella, will he be safe from German measles now? The doctor says yes, but some parents say, the vaccine does not stop the disease. can you through some light into this. Yes, every pregnant mother should be very careful with her health and her baby’s health because she can catch Rubella. This is the very disease I dreaded when I was pregnant with my kids. I prayed hard to never get it, and I thank God I never did. The awful thing about this disease is, it’s the baby who suffers the most and it’s truly painful for any parent to see a child suffer from abnormalities. As for getting German measles despite the vaccines, yes, it is possible. Experts say about 5% – 10% of those injected may still have German measles.